Stand with arms extended out in front holding barbell. Balance on one leg with opposite leg extended straight leg forward as high as possible. Squat down as far as possible while keeping leg elevated off of floor. Keep supporting knee pointed same direction as foot supporting. Raise body back up to original position until knee and hip of supporting leg is straight. Return and repeat. Continue with opposite leg. Supporting knee should point same direction as foot throughout movement. Range of motion will be improved with greater leg strength and glute flexibility. Significant spinal flexion occurs at bottom of deep single leg squat to maintain center of gravity over foot. Erector Spinae becomes a stabilizer if spine is kept straight. An easier, alternative style is to place barbell on back of shoulders, cross lower leg above knee of supporting leg or wrap one foot around back of supporting leg. 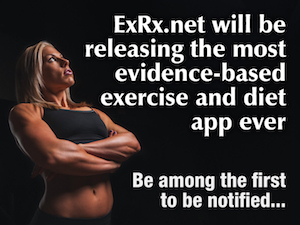 Since 1999, ExRx.net has been a resource for exercise professionals, coaches, and fitness enthusiasts; featuring comprehensive exercise libraries (nearly 1800 exercises), reference articles, fitness assessment calculators, and other useful tools. ExRx.net has been endorsed by many certifying organizations, government agencies, medical groups, and universities. See About Us and Featured Testimonies to learn more. ExRx.net provides free content and relies on advertisement income to maintain this site. If you are using an adblocker, we kindly ask you to support us by adding this site to your adblocker’s whitelist. Other ways to support the continued development of ExRx.net is by providing us periodic donations or placing an order in our Store.